Don't Miss the Chincoteague Shore Craft Beer Festival! « See The Wild Horses of Assateague at the 2018 Spring Pony Roundup! Chincoteague Shore Craft Beer Festival 2018’s featured brewery is Black Narrows Brewing Company. Black Narrows Brewing Co are the first and only craft brewery on Virginia’s Eastern Shore. They opened their doors at the beginning of 2018 and have already left an indelible mark on the local craft beer scene. As mentioned above, the Chincoteague Shore Craft Beer Festival also includes some of the best local food trucks. You’ll see offerings like fresh oysters and clams, fish tacos, crabcakes, chicken, barbecue, ice cream and more. Food pairing suggestions from the brewers can help you decide what to get – and will take that lunch over the moon. Festival attractions include live music, vendor and craft stands, Plein Air painters, and fun distractions for the kiddos. Even dogs are invited, with a special watering hole just for them! Best of all, there is NO entry fee. You only pay if you plan to eat or drink the offerings at the festival. If you DO get a ticket, the beer samples are UNLIMITED. 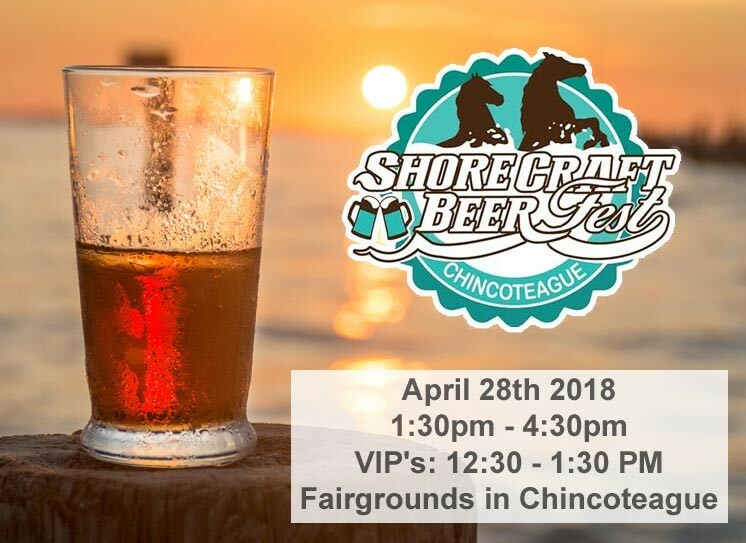 Chincoteague Shore Craft Beer Festival 2018 runs from 12:30pm to 4:30pm. If that seems a mite early for you, fret not! Ropewalk Chincoteague (6262 Marlin Street) is hosting an after-party. Attendees wearing their festival wristbands will enjoy happy hour prices at the restaurant from 4:30pm to 7pm! So go on, grab your tickets for Chincoteague Shore Craft Beer Festival 2018! Get your tickets online for the event. You can also follow the festival on Facebook. Whether you come for the Shore Craft Beer Fest or just some of that famous Chincoteague Island ambiance, Miss Molly’s Inn Bed and Breakfast is here for you! A great night’s rest in one of our 7 guestrooms will help to make your Eastern Shore getaway the very best it can be! Book your stay at Miss Molly’s Inn today!